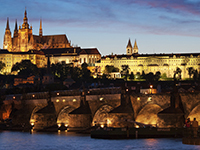 Czech Republic is an extremely popular part of Europe, with tourists often visiting for its exceptional night life and historical attractions such as Prague Castle, Old Town Square and Charles Bridge. Around 300,000 British nationals travel to Czech Republic every year, which can be reached from the United Kingdom by airplane, train or car. Travelling from Birmingham to Prague, Czech Republic’s capital, will take around four hours, but lengthy stops can see this rise to eight hours. The duration of this increases to around 15 hours if you are driving through Europe, which will see you take in the sights of Belgium and Germany along the way. Taking the train, meanwhile, will require around 20 hours travel time. The time difference in Czech Republic is one hour ahead of British Summer Time and two hours ahead of Greenwich Mean Time, which should not require excessive adjustments to how your medicate your diabetes. If you are unsure as to how best to manage your diabetes then it is best to discuss a plan with your diabetes team. The average climate in Czech Republic is almost identical to that of the UK, which should not necessitate any adjustments to your diabetes management. The currency in Czech Republic is the Koruna, or Czech Crown. The Euro is not widely accepted, and establishments that accept Euros will not have good exchange rates. There are no mandatory vaccinations required to enter Czech Republic, but it is recommended to receive vaccination for hepatitis A, which can be contracted through contaminated food and water in Czech Republic. Rabies can be found in bats in Czech Republic. This is not a major risk for travellers, but vaccination is advised for people who will be working or planning activities in remote regions that put them at risk of bat bites. If you believe you may require these vaccines then you should consult your doctor at least eight weeks before travelling which should allow enough time for you to receive them. Otherwise, the opportunity should be taken to ensure existing vaccinations such as your yearly flu jab and those against polio and tetanus are also up to date. Czech Republic is amongst the European countries that allow you to receive state healthcare either at a reduced cost or sometimes for free. It will cover you for medical treatment until you return to the UK. It is best to apply for an EHIC card directly through the NHS. Your card will usually arrive within seven days if you have applied through the NHS, but it is best to apply two weeks in advance to allow for any delays. The emergency services number to be called in the Czech Republic is 112. You should note which syringes are available in Czech Republic, with U-40 mostly used, but U-100 syringes are also available.